Halon fire extinguishants were regarded for many years as the most effective fire suppressants for a wide range of applications. Amendments to the Montreal Protocol of 1987 focused on the manufacture of Halons, however, and their production has now ceased in recognition of their virulent destruction of the ozone layer. In addition, new European legislation requires that Halon systems within the EU must be removed by the end of 2003. 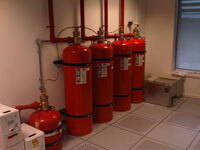 As a result, recent years have seen a substantial reappraisal of approaches to fire protection. Universal Fire Ltd is at the forefront of new technologies in fire safety, offering a range of state-of-the-art fire extinguishing systems. FM-200, a gaseous agent has emerged as a viable alternative to the Halons on the basis of extensive trials. FM-200 is fast and effective with a low space/weight characteristic which is also environmentally-acceptable and safe for human exposure. FM-200 has been adopted by the majority of the world’s fire protection companies and is the most widely used Halon replacement, with tens of thousands of systems installed across the globe. The maximum fill density for a cylinder of FM-200 pressurised with nitrogen to 360 psi is 1.15 g cm -3 . Accordingly, the storage capacity for FM-200 is around 1.5 times that of Halon 1301, the closest of all viable replacement agents. In determining a safe exposure level to any agent intended for use in occupied spaces, the potential of the agent to cause cardiac sensitisation should be determined. FM-200 has been evaluated for this condition via test protocols approved by the US Environmental Protection Agency, and has been cleared for use in occupied areas at the normal design concentration. FM-200 extinguishes fires primarily by physical means. It has properties which function well with traditional Halon 1301 equipment. It is a colourless gas at standard conditions, exhibiting a boiling point of -16.4°C as compared to a boiling point of -57.8° C for Halon 1301. Through the use of properly designed equipment, FM-200 will mix well in a protected enclosure to provide a homogenous mixture in air. Since Halon 1301 is typically super-pressurised to either 25 bar or 42 bar for fire suppression applications, FM-200 is super pressurised to achieve rapid discharge into the protected environment. The liquid density of Halon 1301 at 21 °C is 1.32 kg/L and for FM-200 is 1.17 kg/L. The characteristic that determines the amount of agent that can be safely stored in a given cylinder is the maximum fill density. Fast and effective against a wide range of Class A, B and electrical fires. FM-200 ® is a colourless, odourless gas containing only carbon, hydrogen and fluorine, thereby lacking the ozone-depleting presence of bromine atoms. Highly penetrative and achieving an homogeneous dispersion in the hazard zone, it acts on fires largely by physical means, lowering the temperature of the flame and fuel to a point at which combustion reactions cannot be sustained. There is no significant obscuration on discharge and this non-corrosive and electrically non-conductive agent causes no damage to sensitive equipment with no post-discharge clean-up required. A significant body of toxicity data has been obtained for FM-200 ® from over 70 studies. The US Environmental Protection Agency and the UK Halon Alternatives Group accepts the use of FM-200 ® in occupied spaces up to 9% concentration without mandated egress times and at up to 10.5% with mandated evacuation times. Since the agent does not act by oxygen-depletion in the hazard zone, it poses no human asphyxiation threat. FM-200 ® has a zero ozone-depletion potential and a short atmospheric lifetime. When used in a fire event, FM-200 ® mitigates the effects of an uncontrolled fire and at the end of the lifetime of the system, the gas can be readily recovered and recycled. have been selected for use with FM-200 ® and have been subject to stringent testing procedures. Flexibility, quality and reliability make the range the worlds finest in fire safety and the equipment carries third party listing through the Factory Mutual Research Corporation and the Loss Prevention Certification Board. Systems are UL1058A compliant. Both engineered and pre-engineered systems are available. The pre-engineered systems offer a low engineering/design cost option with defined maximum design parameters. Engineered systems offer optimum designs for the defined risks with reduced pipe sizes, unbalanced flows and common room and void protection possible. A wide range of sizes is available, offering a choice of fill capacities to meet specific requirements and ensure maximum economy in installation. Each cylinder is manufactured from high strength alloy steel. The larger cylinders have an optional liquid level device for ease of contents monitoring and improved system maintenance. All related components from discharge nozzles to control heads are designed to be compatible, allowing a complete system to be configured using FMRC and LPCB approved equipment. A range of custom-designed nozzles is available including 180° wall-mounted and 360° ceiling-mounted types. System space and weight are usually at a premium in industrial and commercial premises. FM-200 ® is stored as a liquid in nitrogen-pressurized containers at 25 or 42 bar, leading to minimal storage requirements comparing favourably with all other viable gaseous agents. FM-200 systems are FM listed; meet the criteria of UL1058A and carry LPCB design manual and component approval. Systems are designed to conform to BS EN 15004-9 2008, NFPA 2001 and BFPSA Code of Practice requirements. An empirically-verified windows-based computer program is used to model two-phase agent flow and ensure that the correct concentration of agent is achieved within 10 seconds throughout the protected zones as required by the NFPA Standard and BFPSA Code.